It is located in the northernmost of Gyeongsangbuk-do. And it has 1.201k㎡ area, which is twice as large as that of Seoul. Bonghwa is clean area, which woods and fields amount to 83%. It has a lot of famous mountains like Cheongnyangsan mountain, Munsusan mountain and Taebaeksan mountain. 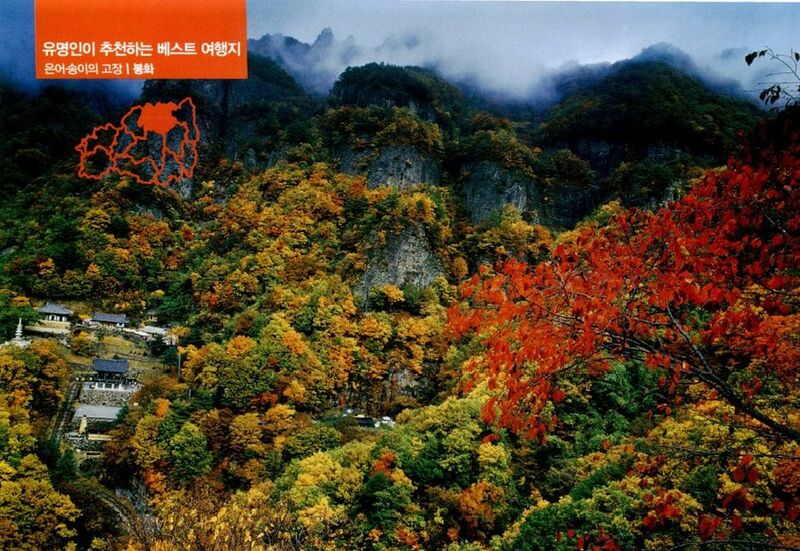 Baekcheon valley, Seokcheon valley and Goseon valley are the habitat of Manchurian Trout. The region has cherished clean nature and beautiful landscapes. You can see old houses everywhere. In particular, it has the highest number of pavilions in Korea. 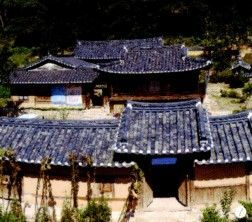 (105) Bonghwa is the region of culture with a number of cultural heritages. Moreover, it is the region of festivals all the year around, so seasonal festivals like Bonghwa sweet fish festival, snow flower train festival have been held every year. Rafting in Inari riverside is the best sport in summer vacation. Royal azalea blossom around the riverside of Teokkeol rock in early spring. The cross section of Milseongdae rock looks irregular. Dongpungseok seems to drop at any moment. Geumtapttong, nine towers made of gold, consists of pacific cliff. All landscapes are awesome. Cheongnyangsan mountain. It is a rocky mountain in which clear wind flows the deep forest in fall. It has been called “Sogeumgang valley” since it has beautiful landscape and clear water of Nakdonggang river flowing under the mountain. It has been cherished by ancestors. 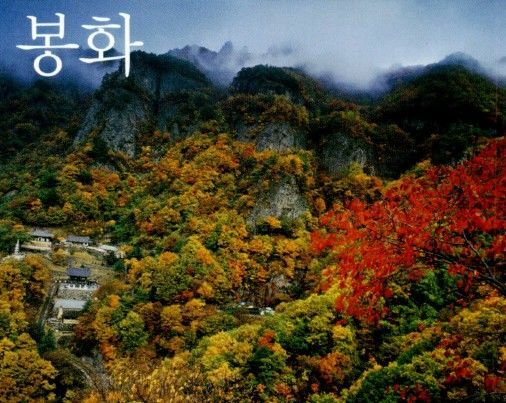 Teogye Lee Hwang wrote Cheongnyangsa for praising the beauty of Cheongnyangsan mountain. In fact, a number of writers brushed up on their study in the mountain. The famous writers are Wonhyo, Whisang, Kim Saeng and Choe Chi-won. Moreover, King Gongmin entered Cheongnyangsan mountain to avoid Red Turban invasions of Goryeo. Many stories about them have been passed down. Cheongnyangsan mountain is raised at Jungang range, the branch of the Taebaek mountains. It has fine scenery as it consists of a number of oddly formed rocks and strangely shaped stones. But it is not a huge mountain. Janginbong, the highest peak, is about 870meters high, and its area is only 48.76㎢. The Ambong peak region is only a tenth part. Although it is small, it has a number of beautiful natural landscapes. I agree that it has been called as Sogeumgang valley. Royal azalea blossom around the riverside of Teokkeol rock in early spring. The cross section of Milseongdae rock looks irregular. Dongpungseok seems to drop at any moment. Geumtapttong, nine towers made of gold, consists of pacific cliff. All landscapes are awesome. 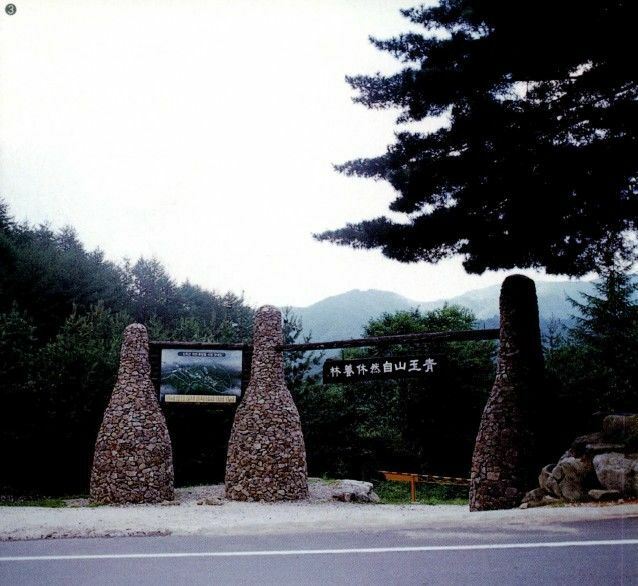 You should begin mountain climbing from the standing stone under the rest area of Cheongnyangsan mountain. 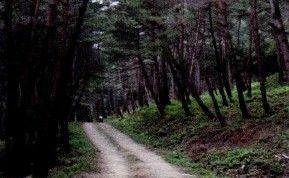 Walk along the trail with old pine trees, and pass by Osandang and Naecheongryang. When you climb Janginbong mountain top, you can overlook Nakdonggang river and the ridge of Cheongnyangsan mountain. The course from Bosalbong, Gimsaenggul to Oecheongnyangsa is the famous way back down. Rafting is popular with many people as they can enjoy the course of a river around Cheongnyangsan mountain. It has wide width of a river and gentle slope so that you can enjoy both sports and beautiful landscape. Maeho amusement park district with Nakdonggang river and Ungokcheon is a good rafting course. Cheongnyangsa temple, which is full of amazing clouds, is one of the famous tourist attractions of Cheongnyangsan mountain. The temple has been known for temple concert recently. It is located in the middle of the mountain. Cheongnyangsa temple road is a little bit steep, and surrounded with pine forest. After walking through the woodland path, you can see the temple. It was built by Saint Wonhyo in 663. King Gongmin stayed here to avoid Red Turban invasions of Goryeo. In particular, Cheongnyangsa temple is beautiful when it is full of mist around the valley in the early morning. The temple is crowded with many people on September when temple concert is held. You can see sky-bridge, the new tourist attraction of Cheongnyangsan mountain, after walking the trail about an hour. It is the longest(90cm lengthy) and the highest(800m above the sea level) bridge in Korea which is built in a mountain area. So you must visit here. I experienced the unity of human and the nature on cloudy sky-bridge. Archives Historic Site of Taebaeksan mountain has preserved the Annals of the Joseon Dynasty. You can feel the spirit of yangban in House of Mansan and Dakkil village. All mountains and old houses of Bonghwa are amazing. Seong I-seong, the military official of the middle Joseon dynasty period, built Gyeseodang to train junior scholars. He was the son of Seong An-wui who was Namwon high ranking official. After passing the state examination, he served as the chief in six provinces, and was appointed to the royal secret inspector for four times. Seong I-seong has been famous for his thrift and honest poverty. Gyeseodang has attracted people's attention after the professor Seolseonggyeong of Yonsei University published the thesis,”the real person of Lee Mong-nyong in Chunhyangjeon would be Seong I-seong”. Seong-sup, the fourth generation of Seong I-seong, wrote “Gyowuimoongo”. It is saying, “Money, authority, beauty and alcohol are the blood of people. Delicious foods and tables are the scream of people.” Besides, the literature and materials like Usawha, Pilwonsaneo and Hanam Amhaengnok have been passed down. Gyeseodang is located in Gapyeong-ri 301, Murya-myeon, Bonghwa-gun, and designated as No. 171 national important folklore material in January 10, 1984. Daksil village is the village of Andong Gwan family. Like its name, the village looks like “the gold chicken incubating eggs”. It is one of the four propitious sites along with Yangdong in Gyeongju, Naeap in Andong and Hahoe in Pungsan. 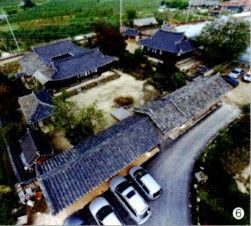 There is the head family of Gwonbeol(1478~1548), the high ranking official of the middle Joseon period, in the middle of the village. Next to the head house of Gwonbeol, there is Cheongamjeong on the turtle shaped huge rock. A pond flows around the rock, but it is a rare architecture style. So it has been recognized as the important material for landscape architecture study. Hangwha(Korean traditional sweets and cookies) of Daksil village is famous all around the country. It has 500 years long history, and handmade right after the order. 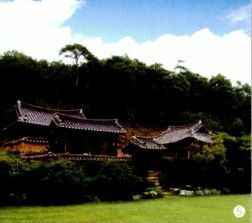 House of Mansan, which is located in Uiyang-ri, Chunyang-myeon, has kept the spirit of yangban in the Joseon dynasty period. Kang Yong(姜鎔, 1846~1934), the high ranking official of the late Joseon dynasty period, built it in 1878. A tall gate is located in the center of 11 long servants´ quarters, and the detached house is surrounded with seodang(village school) and walls. The detached house and the main building are attached each other to the side of wide reception hall. Chiryuheon with a library on the left and the separated house on the right is surrounded with soil walls separately. The old house made of Chunhyangmok is still so beautiful that a lot of architectures have visited it. It has been equipped with flush toilet and shower room recently, so you can experience B&B. 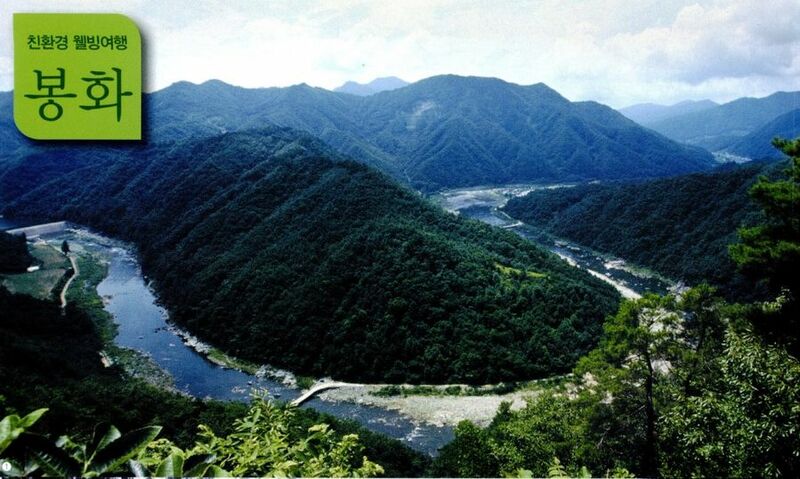 The course of a river, which is hidden in the high mountain, is the masterpiece of high mountains and deep valleys in Bonghwa. Maeho amusement park is located in Docheon-ri, Myeongho-myeon, Bonghwa-gun, the most beautiful place in Gyeongsangbuk-do. It is the confluence of the main stream of Nakdonggang river and Ungokcheon. It is the natural tourist attraction, the official point of Nakdonggang river of Youngnam. There are plenty of fishes like sweet fish and Coreoperca herzi thanks to the clean and cool water all the year around. So it is popular with many fishing lovers. Maeho amusement park has beautiful river flowing around Cheongnyangsan, and amazing natural landscapes. It is popular with families and couples since it has best drive courses. It is crowded with a lot of tourists those who come to enjoy rafting and auto camping in summer. Spring is green, and fall is full of beautiful autumn leaves. It has amazing snow scene in winter, so it attracts many mountain climbers. The park has various attractiveness. Over 100 years of large trees, pine trees and larches cover the sky. 40 kinds of needleleaf tree s and broadleaf trees are well matched each other in the dense forest. 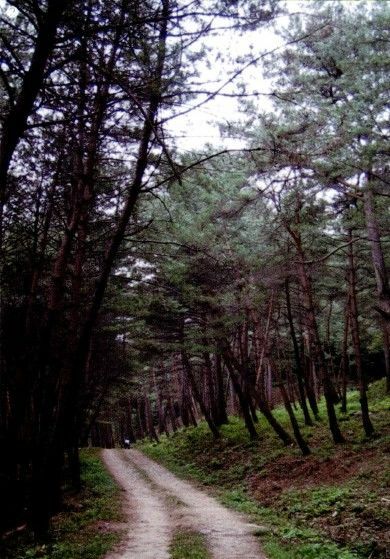 It is the best place to take a walk along the narrow trail while breathing soft tree fragrance of Chunyang pine trees. There is one thing. The blossoms of magnolia are awesome in spring. It is equipped with pool, multipurpose dam, playground, gym, sports field and campfire ground. You can enjoy tourist attractions like the source of Nakdonggang river and Miin falls in Dogye-eup nearby. “Bonghwa national Baekdudaegan arboretum” is supposed to open in 2014. It is the Chunyang pine tree habitat in Munsusan, Seobyeok-ri, Chunyang-myeon, Bonghwa-gun. When the trees were deforested along the water way of Han river, the habitat was kept due to inconvenient transportation. The trees have been sold all around the country after Yeongdong Line was established. Since then, Chunyang pine tree has been called as the best pine tree. There are about 1,500 thick Chunyang pine trees in the habitat. These were designated to the wood resources for repairing and restoring cultural assets like palaces and traditional temples. I recommend families to enjoy well being tour with fresh course tracking and woodcraft experience center. Small shapely socks road is the vague mountain path. You can walk the course of Chunyang-myeon, Bonghwa-gun for six to seven hours while breathing the fragrance of apple flower and pine. Walk along the orchard after looking around a five-day interval village market in Chunyang. 17.6 kilometers road, which is full of Chunyang pine tree fragrance, connects each villages. You can take a walk easily as it consists of village road, riverside road and gentle woodland path. Endless farmland and apple tree farm stretch over the village road. There are warm old mud-plastered wall houses. You can often see pheasant, Eurasian Red Squirrel and moose in the woodland path. Gentle hills with beautiful natural landscape and clean air are full of pine tree forests. The ox cart bank path and orchard road are pleasant. Chunyang 5-day Market(4, 9 days) is full of chemical-free wild edible greens. White flowers blossom in spring, and red apples cover the apple farm. Old house road of pavilions like House of Mansan and Kwonjinsa daek is elegant. Why don't you walk the road with the nature, history and tradition? The road to Seungbu Station has been known to the world after loop line snow flower train operated. It is 12 kilometers on foot from Seokpo Station to Seungbu Station, and it takes about three hours and 20 minutes. It is a romantic road where you can walk along the track while looking around beautiful landscape of the upper region of the Nakdonggang river. You can feel the nature when you see the beautiful landscape of vivid green mountain, cool valley, white heron and heron. In particular, you would find the clean water when you soak your legs in the cool water. You can also see a bunch of wild edible greens nearby. The road to Seungbu Station has not been damaged as it is inaccessible with the train. So it is wild, but beautiful. You may lose your heart to wild flowers, but enjoy the pleasant journey watching the trains on the ridge.